He started to talk to me. He asked where I was from. “Scotland” I said. “I've been there” he said. He wanted to know more about it. I told him of our cities, the people and spoke of whisky and haggis. He told me he'd been in the navy and the army. That he sailed into Aberdeen. That he slept with a barmaid there called Mary! He spoke of flying war planes. He told me he did a bad thing; that he missed a target… That he dropped a bomb on a church instead of an army base in Croatia. That he didn't realise until after he landed. He shed a tear as he spoke of this tale. He was only 17 when it happened. He spoke of his friends in Scotland. That are now gone away. That out of five of his friends that left Australia, only two returned. He was one of them. Shot three times, he also had a bad knee. Throughout our conversation he called me Scotty. He told me his name was Robert James Meade. He called himself 'Captain'. He politely answered my questions with a 'yes ma'am' or a 'no ma'am'. Similarly to me he sometimes uttered a 'whaaaat' and quite a few 'aww man's'. These made me smile. We talked about Perth and about the water. 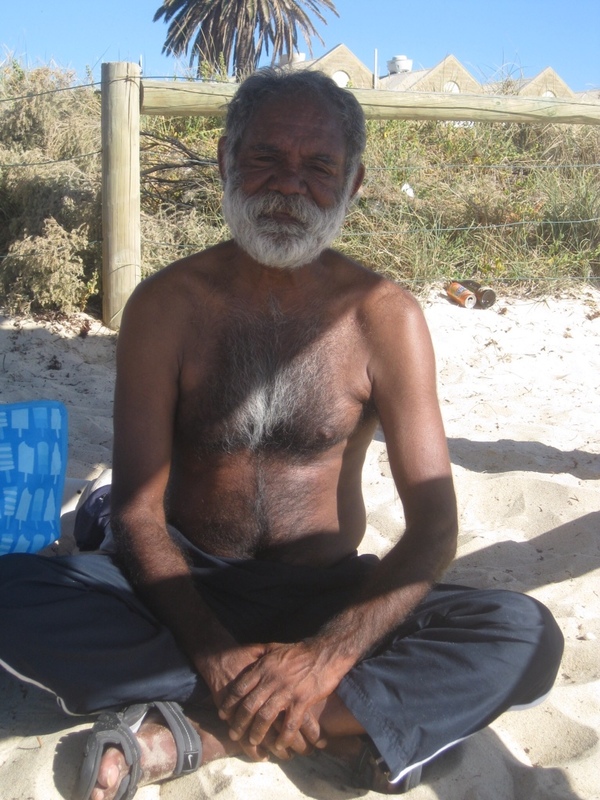 Sitting on bathers beach, he told me it is his favourite beach. He pointed out the lighthouse. I told him I'd walked to this previously. I asked if he knew the lighthouse's signal. He did. We spoke of sunsets and sunrises and agreed that if you managed to see one its usually been a good day :-). We spoke about respect and being nice. He said “if you love someone treat them with respect.” “If they don't respect you does that mean they don't love you?” I asked back. “That's right. They no good” he responded. I asked whether I should stay in Perth or try Sydney. He told me I would work it out and then added that I shouldn't worry so much. I left him on the beach, walked to harbour's end, sat atop a rock and wrote about him. I was actually about to give up blogging for a while… This man inspired me to write. To share his story. I went and got some fish and chips. I had promised to watch the sunset with him. The sun was below the horizon by the time I got back but it was still nice and pink. I hope that was enough… I said thank you to him. That he had inspired me to write. He asked me not to forget him. I definitely won't. I have no idea if his story is true or whether only parts of it are but it certainly provided me with an interesting afternoon. A story that certainly puts travelling dilemmas into perspective. I loved playing tell me your story. I love meeting new people with new stories. I could have sat anywhere else on the beach and would have missed this tale. This man not only entertained me, but with the combined help of the waves and the water relaxed me and helped me find my happy place. This feeling has made me decide to stay in Perth. Thank you Captain Meade :-). Loved this post Sue.. It’s a shame more folk don’t take the time to sit and talk and share life stories. Thanks for reading Gracie… knew you’d love it too. Cool moment 🙂 Thanks for sharing. Please keep up with the blog – it would be a shame not to have it.